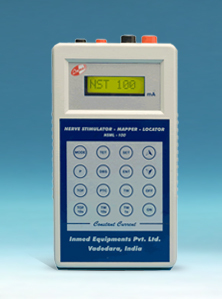 Nerve Stimulator-Mapper-Locator Model NSML-100 » Products » Inmed Equipments Pvt. Ltd. It helps to indentify the entry point thereby reducing patient discomfort. also useful in defining anatomical landmarks, especially in growing children, obese patients and in case of patients with distored anatomy. Identifying Nerve during Neuro, Ortho, Ent, Pacdiatric and Plastic Surgey. (eg. Facial Nerve). A unique model to identify sensory nerves like lossopharyngeal and other nerves in pain management. 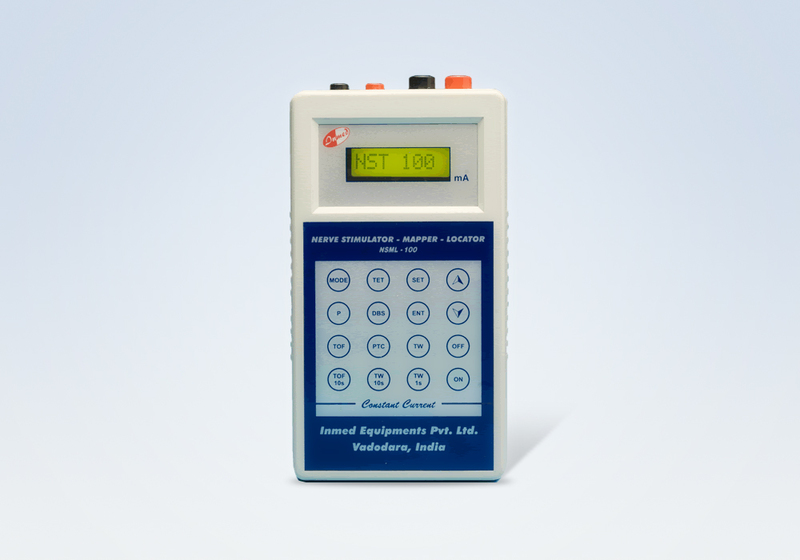 Separate output for Nerve Stimulator - Mapper and Locator for safety. Automatic switch over from mains power adaptor to rechargeable 9Vbattery with low battery warning indicator. Feather-touch keypad for easy operation, simple setting and extended reliability. Variable current range as per the selected mode(impedane:0 to 5 kohm). User programmable pulse width and frequency. Alphanumeric LCD display with back light. Audio and back light on-off option. Small, Light-weight and user friendly. Compact size 100mm X 180mm X 40mm.